FA: John Shewchuk, Grant Hiskes, Bill Serniuk, 2005. The first pitch is a long, fun pitch with tightly-bolted 5.10a knob climbing and lots of sustained 5.9. Second pitch has a well-bolted 5.9 section on golden rock followed by some runouts on easy terrain. 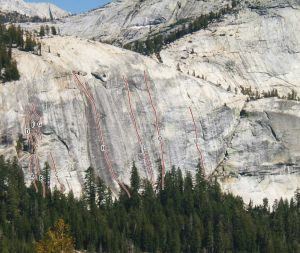 An old route called Knob Job climbed through the same section of the wall as this route, but had only one ¼” protection bolt, a single ¼” anchor bolt, and no other pro has been found – perhaps even including no-pro “belays” on sloping stances. Which SuperTopo guidebooks include a topo for Loud and Obnoxious?